As recently as 1984, the Chinese government decided where everyone would work, what factories would produce, and that you could have just one child. But the state soon decided that after meeting its quota, a factory could sell what it had left over at any price. With that ever so slight injection of the market, China began an economic ascent that transformed its trading relationship with the U.S. These are the six facts that tell the story. 1. Thirty years ago China’s low tech exports to the U.S. were minimal. 2. 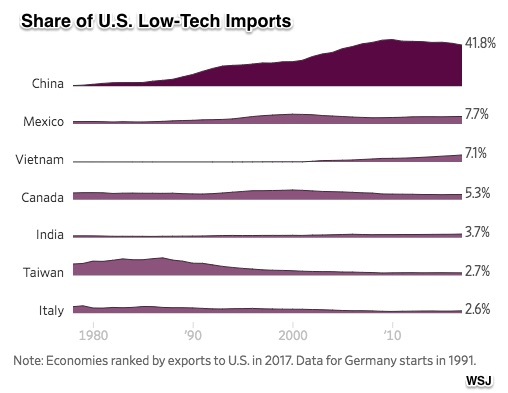 Within approximately ten years, the volume of those those low-tech exports surged. 3. Then, in 2001, China Joined the World Trade Organization (WTO). WTO membership made China a member of the club. Agreeing to lower tariffs, eliminate quotas and licenses, diminish state import controls, and open its service sector to foreign investment, China hoped for the economic gains that would come from more trade. 4. Only eight years after joining the WTO, China was sending us low- and mid-tech goods and more high-tech too. Without implementing all it had said it would do, China soon enjoyed the benefits of the WTO. Its exports doubled in three years, tripled in four. In the other direction, foreign investment surged. 5. 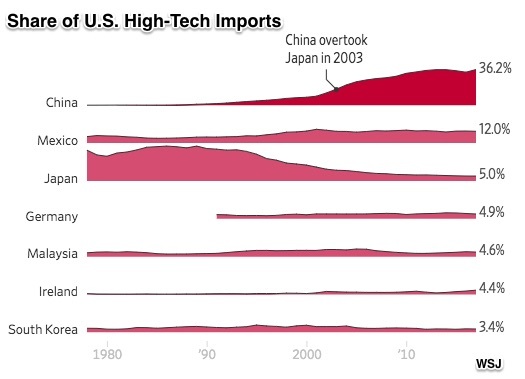 By 2017, China was in the top spot for U.S. high-tech imports. 6. And China continues to send us low-tech too. During the past four decades, China’s productive capacity became increasingly sophisticated through a mixture of command and the market. The command side is dominated by SOEs–the state-owned enterprises that control key industries and finance. Indeed, if you looked at telecommunications, construction, banking, and other economic “pillars” you would see national and local governments running big business. The interesting part though is that there is self-interest, competition, and wealth accumulation among a vast number of privately run companies. Add to all of this a nation that has begun experimenting with social scores that shape people’s behavior and you wind up with an economic system that is far from what Adam Smith called the market. And yet, as an economic development engine, so far, it has worked. My sources and more: For economic history, this WSJ series of graphics is superlative. Not quite as good but a complement to the Journal, this Washington Post article and Bloomberg had more facts. Meanwhile, for a solid fact source on SOEs, this University of Alberta paper had the details and the overview. Finally, for yet another history, the NY Times has a series on China. Lastly, if you want a different spin, Brookings has a 2001 article with what was the contemporary perspective on China’s WTO membership.